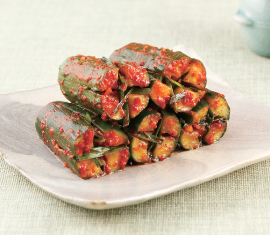 Characterized by a crunchy texture and crisp taste, oi sobagi is a type of seasonal kimchi best enjoyed in the summer, when cucumbers are in season. ① Rub cucumbers with kosher salt and wash thoroughly.Slice off ends (about 1cm) and cut into 3 to 4 pieces. Make cross cuts from top to bottom, but leave about 1cm uncut at the ends. ② Soak cucumber in brine for about 30 minutes then rinse once and drain. ③ Cut chives about 2cm long and julienne radish 2cm long. ⑤ Mix the filling with 4 then set aside for about 20 minutes. Stuff filling into the cucumber cuts. Put in air-tight container and leave in refrigerator for 3 days before serving.